The 27th running of the Breeders’ Cup World Championships will take place under the historic Twin Spires. Kentucky is known as the horse capitol of the world, and what better place than Louisville, Kentucky to see the best in the world converge to do battle? The day is chock full of the great runners, and some entered are the best in the world. With Zenyatta going for a perfect 20 in a row record, everyone will be a racing fan on this day. The 6-year-old mare has graced the pages of Oprah, and has been on 60 Minutes. This is one day you will want to watch as racing history attempts to be rewritten…..
Race #4 – Breeders’ Cup Juvenile Turf – 1:50 p.m.
#9 Soldat (8-1) should be up close, and has shown the ability at a young age to win on various turf courses. #8 Banned (10-1) has the look of something special as he is 2/2 with wins on the green. #13 Pluck (6-1) is my top pick in this heat. His dam was a monster for the grass. His last race at Woodbine was the selling point for me, and the course should be a great deal like Churchill Downs. Race #5 – Breeders’ Cup Sprint – 2:30 p.m. The median payoff for this race yields better than $30 to win, so don’t be afraid of the longshots. #12 Warrior’s Reward (12-1) should enjoy the hot pace in the race. He has the ability to fly down the lane, and is no stranger to the Churchill going (4/4 ITM). #1 Big Drama (7-2) has drawn the rail. Other than Calvin Borel liking to hold the paint closely, it does not yield a high % of winners. He runs very well fresh, and has a an incredible workout to show he is ready. I see Eibar Coa giving him a great ride on this day. My top pick will be #2 Girolamo (3-1). The prices do well in this race, but over 50% score at less than 5-1. Exits a victory in the G-1 Vosburgh, and was steadied down the lane. The bullet work on 10/30 at Churchill shows me a readiness to roll. Race #6 – Breeders’ Cup Turf Sprint – 3:15 p.m.
#9 Rose Catherine (6-1) has been having a great year. She is 8/8 on the turf in the money, and is 4/4 at the distance with wins. #5 Silver Timber (4-1) is a closer in this bunch. Julien Leparoux always does well on the turf winning at a rate of 16%. This gelding is honest, and can give them fits. My selection is #11 Grand Adventure (12-1). This is the third off a break, and comes out of Canada running a huge race in the Nearatic. I see this runner closing soundly, and Patrick Husbands wins 40% for trainer Mark Frostad. Race #7 – Breeders’ Cup Juvenile – 3:55 p.m.
#7 Uncle Mo (7-5) has caught the attention of many racing fans. Distance will be the big question, but he is so loaded with talent that we may see 7-5 as a big value play here. #2 Boys at Toscanova (5-2) looks to be a colt on the rise. I don’t think we have seen his best as of yet. But, we may see Ramon Dominguez find a new gear. #10 Jaycito (8-1) is my top selection. Trainer Mike Mitchell is loving his trip to Louisville this year, and he is no stranger to the Breeders’ Cup. This son of Victory Gallop can get out of the gate in a bad fashion, but he gets down and dirty when the running gets real. Race #8 – Breeders’ Cup Mile (Turf) – 4:40 p.m.
#10 Goldikova (6-5) looks to make this race a three-peat in her resume. She is so impressive, and the last race at Longchamp in France in the Prix De La Foret was a nice prep last year. She comes right back off the same trip, and looks to be the one to beat. Olivier Peslier comes into town to get the job done, and will be awfully tough in here. #6 Paco Boy (6-1) has been chasing Goldikova for sometime. It is just a matter of time before it happens, and the Euro shippers should hold their own overall. My selection is #11 Proviso (12-1). Mike Smith has the call, and he will be all stoked up for the history-making ride later in the day. This one here is 4-in-a-row on the turf, and she can get busy late in the game. I like the price, and you have to think twice before tossing out this runner. Race #9 – Breeders’ Cup Dirt Mile – 5:20 p.m. The median payoff in this race yields $2.80 to win. The only problem is finding that chalkster to follow the trend. #5 Here Comes Ben (6-1) is doing very well. If you go for the “horse for the course” thinking, then you should know he is 5/5 ITM at Churchill. #2 Tizway (6-1) holds an edge. 3/3 this year getting a check, and Rajiv Maragh has gone around the world to ride this runner. He has faced some that are running in the bigger Classic, and they are not in here today. My top selection is #8 Crown of Thorns (4-1). He has been doing good work in California, and the morning works are red-hot. Richard Mandella brings his runners ready, and Bejarano knows Churchill very well. Race #10 – Breeders’ Cup Turf – 6:00 p.m.
#4 Debussy (10-1) has the service of William Buick, and was the winner of the Arlington Million. He has quick acceleration, and will need it on this day against this group. #6 Workforce (7-5) was the winner of The Arc de Triomphe in France. The connections have been really concerned about the firmness of the Churchill turf course. Sir Michael Stoute is coming over to survey the situation the next couple of days as they are watering the track at night to get some moisture into the surface. The course is safe, but the Euros like a course with a little give to the turf. My top selection is #7 Behkabad (9-5). Lemaire in the irons, and he is double tough. Had no room in the Arc, and with a clean trip, can give them something to talk about. Race #11 – $5 Million Breeders’ Cup Classic – 6:45 p.m. This race may be the maker of history. If the morning favorite wins, they will mention Zenyatta with all of the greats in racing. She is seeking a perfect 20/20 record, and the trainer is about as cool a customer as they come. She has a great chance to take history into her hands as she makes her last start of her career. #8 Zenyatta is the 8-5 favorite, and runs like she is a train going downhill. If you can find a hitch for her, good luck in finding the loophole. History is hers for the breaking, and she is dappled out which means she is in good flesh, and everyone will be watching this 17 hand mare do her running under the Churchill lights. Good luck, Queenie! 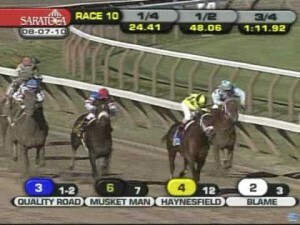 #5 Blame (9-2) is the runner who did not get the best of trips last out. The Jockey Club did not allow him to get his best stride. It was a long drive, and Garrett Gomez did not get into gear until way too late. I don’t see that being his story, and he will be out and running when the money is on the line. #1 Quality Road (5-1) was scratched out of last year’s Classic when he acted up at the starting gate. A speedster here, and Pletcher brings them ready. The one post, and the rail may not be the most coveted place, but he can overcome much. My selection is #12 Lookin At Lucky (6-1), who is looking his very best. His flesh is glowing, and he couldn’t be doing any better. 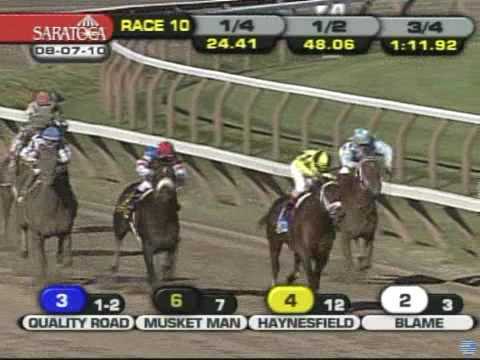 Three races ago, Gomez was taken off of this runner after the Derby, and Martin Garcia has fit like a golden slipper. He is 3/3 with wins, and the distance should be no problem. I think his biggest challenge will be looking Zenyatta in the eyes and slugging it out down the lane. I think he has the edge traveling and getting his prep in fine fashion. The works are solid, and I am awaiting a great showdown. This will be a day that you will not want to miss. For fans of all walks, this will be a day that you will want to be tuned in. May all of the runners have a safe trip, and your winners be many, and photos be few! YOUR SITE IS GREAT. HOWEVER, WE ARE KNEW TO HORSE RACING AND WOULD LIKE TO KNOW HOW WE CAN OBTAIN A COPY OF HORSE CHARTS OF ALL OF THE HORSES RUNNING IN RACES, UPCOMING RACES? Tony, on our site, we provide our selections for the races which includes each horse’s past performance data.